Evie Clair's father has sadly passed away from his cancer battle ahead of America's Got Talent's twelfth-season finals. Evie, a 13-year-old AGT finalist, lost her dad, Amos Abplanalp -- whom she had dedicated all of her vocal performances to on the show -- on September 7. "I will forever miss my sweet Daddy and cherish the last few moments I had with him, holding his hand, before the end. Love you lots!" Evie tweeted late last week. Evie also expressed her feelings on Instagram, calling her experience in the America's Got Talent semifinals "the best and worst week" of her life. "I'm so grateful for the memories I've made with my family in the past year and a half. I'm so grateful for my dad being such a great example of faith and strength. He has endured so much and all that pain has finally come to an end. He is in a place '12 gazillion' times better than this and I know he is so happy there," Evie captioned a series of beautiful father-daughter and family photos. "Thank you to all the people who have supported my family along this journey. I love you all. I'll miss you so much, Daddy. Thanks for teaching me to love salsa and chicken wings and most of all the Lord. Love you lots. RIP: 9/7/17." Evie later added, "'Say a prayer, a prayer on forever. Time is only now, Soon we'll be together.' I hope I made you proud, Daddy. I've always done it for you and I'll do it for you forever." 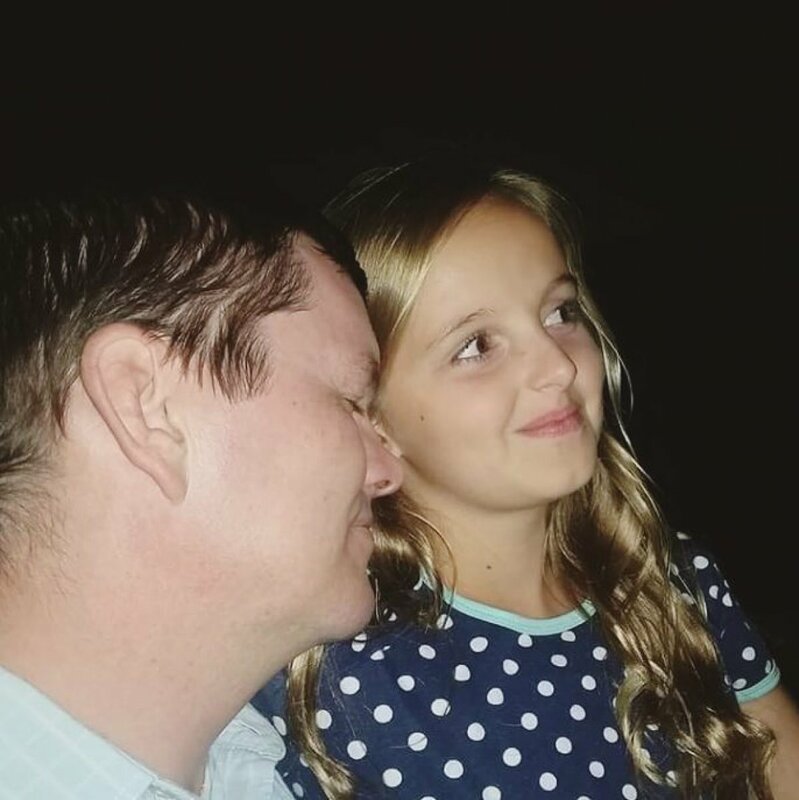 America's Got Talent also shared their condolences with the Abplanalp family, writing on Twitter, "We are deeply saddened to hear Evie Clair's father passed away last night. Our hearts are with Evie & her family during this difficult time." Evie's mother Hillary Abplanalp maintained a daily blog dedicated to her late husband's cancer battle, and it included many high and low moments for the family. On September 7, Hillary wrote about her last moments with Evie's dad, whom she called her "sweetheart," in the hospital. "[Amos] couldn't communicate with me but I felt his spirit and rested well. The deep pain and anxiety of Tuesday were gone and I felt peace... [His brother] Tom received inspiration that our action should be to take Amos off life support and allow for God's will to be done while allowing room for a miracle of healing or room for Amos to be released from a body that had been taken over by cancer," Hillary shared. Hillary had taken her children out of school and asked for their council in making this big decision. Evie was also flown to Florence, Arizona to see her father following America's Got Talent's September 6 live results show. "America's Got Talent made arrangements to get us home immediately after the live results show... We are so thankful to them for their kindness and understanding. [Judge Simon Cowell] isn't the only one who gets emotional about Evie Clair. Dozens of producers and staff members are going through this challenge with us and we love them for it," Hillary wrote in the blog. As a family, everyone agreed to turn off Amos' life-sustaining machines with tears in their eyes, according to Evie's mom. "We watched him take his last breaths as he continued to breathe for about 15 minutes on his own," Hillary revealed in the blog. "The children burst into tears but are now at home laughing at old home movies of daddy and remembering our great love for the most wonderful man any of us have ever known... We will be with Amos again and we feel he can now be with us without the restrictions of his mortal body." For her initial America's Got Talent audition, Evie sang Christina Perri's 2011 song "Arms," a ballad she often sang to her dad to get him through difficult times. "About a year ago, my dad was diagnosed with Stage 4 cancer," Evie tearfully told the judging panel during her audition. "They gave him a five percent chance to live, and he continued working and supporting our family. So tonight I'm here to sing for him." Peter Kraus -- Chris Harrison: He would still be great on any 'The Bachelor' spinoff, he's not dead or gone!